I left academia, so why come back? Everyone who begins a PhD comes to that decision their own way. This is an explanation of the path I’ve taken and why. My name is Megan Whewell and I started my Astrophysics PhD here at MSSL less than a month ago. My project is looking at X-rays from Active Galactic Nuclei (AGN) and using spectroscopy to discover more about them. 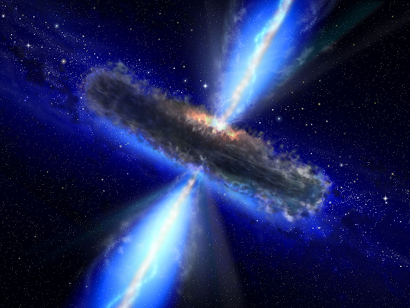 AGN are supermassive black holes at the centre of other galaxies that are accreting matter and by doing so giving out huge quantities of radiation (hence, ‘active’). At this stage I’d barely thought about a PhD and instead started the year focusing on my two final year projects – research into the formation processes of massive stars (stars that have more than eight times the mass of our Sun) and designing a museum exhibition about asteroid and comet impacts on the Earth. Many of my coursemates from Astrophysics wrote their PhD applications by Christmas that year, confident in the academic path they wanted to take, but I wasn’t yet sure. Then they had interviews, acceptances (and rejections) a few months later but I still wasn’t sure. I expected to feel relief and elation when handing in my final projects in April and didn’t expect to want to start another, much longer academic project. ‘Hand in day’ approached and I still enjoyed research, even the writing up process! ‘Hand in day’ passed but no sense of relief to be finished appeared; there was more research I’d wanted to do and I was disappointed to have reached the deadline. This certainly made me briefly reconsider a PhD but I had missed that year’s application deadlines and needed to find work. My love of “talking about space” led me to a job at the National Space Centre in Leicester (UK), first just in Education then with split time between Education and the wider Communications department. Among many other things I taught school children about astronauts and wrote blogs about the latest Space news. It was there I learnt my first programming language, rather than dabbling in a few, but not one most people reading this will recognise. 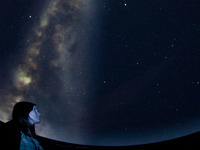 The language was called D3 and controls the planetarium there as you travel ‘live’ around a virtual universe. My favourite part of work was the satisfaction of finally getting the code right so you can watch the view as you fly away from Earth and outside of our galaxy or lift off and see the Earth rise up in front of you. This experience, combined with a desire to continue reading academic papers (which will wear off soon I’m sure! ), was what led me to apply for PhD positions after just over a year out of academia. I wanted my own project; I want to learn, explore, discover and explain things that have never been known before. For me, a PhD is the perfect way to do this and so far my time at MSSL has been living up to all I expected of it. I hope to be able to write for MSSL Astro again, but if you want to read more about my own time at MSSL I have a personal blog here.